The Democratic Republic of Congo army says it has retaken three key towns formerly held by the forces of rebel leader General Laurent Nkunda. A long-awaited offensive by government forces, with logistical support from the United Nations, began on Monday. The army deployed helicopter gunships and heavy artillery in the assault on the towns, 40km north-west of Goma. 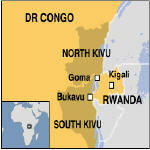 Gen Nkunda has ignored repeated warnings to relinquish control over areas close to the Rwandan border. The general claims he is defending his own Tutsi community against Rwandan Hutu rebels responsible for the Rwandan genocide in 1994, who have been roaming eastern DR Congo ever since. The army says it has taken Nyanzale and Sake and is battling to take full control of the main rebel stronghold of Mushake. The battle recommenced at dawn on Tuesday with an artillery bombardment. During a lull in the fighting, the BBC's Arnaud Zajtman spoke to a regional commander who said the army had suffered only a single death compared to 12 rebels during Monday's battles. Mushake overlooks a key road that links the regional capital, Goma, with valuable tin mines and rich farming land further west, our correspondent says. The small hillside town is a stronghold of the rebels and its buzzing market centre is inhabited mainly by Tutsi cattle farmers. The elected Congolese government has made a commitment to flush out the Rwandan Hutu rebels, and says Mr Nkunda and his 6,000-8,000 men should also lay down their arms. A military spokesman for the UN mission in DR Congo said UN peacekeepers are bringing logistic support to the government forces, but are not engaged in any fighting. Some 15,000 UN peacekeepers are in DR Congo to secure peace after a five-year conflict officially ended in 2002.